Sangria is hands down my favorite cocktail simply because it has wine. And yes, if you’re guessing… I LOVE LOVE LOVE me some wine—especially red wine. Sangria is awesome because it combines wine, fruit, fizzies, and brandy! Listen to me—a sangria isn’t a sangria without some brandy. Granted, I have had some good sangrias without brandy but the BEST one always tend to have a little extra kick in the form of brandy. However, if you’re not crazy about brandy or if you don’t want to anymore alcohol to sangria, then feel free to omit. Today I’m showing you how to make a Caribbean Style Sangria both red and white. I realized that while I’m crazy about red wine, there are some who are crazy about white wine. Now while it’s easy to think that Sangria is strictly a summer drink, I will argue that it’s great to have year round! Yes, ma’am it is. You’re probably wondering, “Zee what makes this a Caribbean Sangria and how is it any different than the Sangria we’re used to having?” Caribbean Style Sangria is my twist on a classic. If you’re new to my blog/YouTube then let me just say, “Hi my name is Zee and I like to remix just about everything.” If you’re a regular, “Hi five. You know the deal!” Regardless, both of these Sangrias have fruits and flavors that I grew up eating like mangoes, kiwi, guanabana aka soursop, and guava. They’re fruits that you don’t traditionally find in Sangrias but pair oh so nicely! Give these Sangrias a try and let me know what you think. Also if you can’t find some the fruits and nectars that I used, don’t fret. You can very easily swap them out for ones that you can find at your local supermarket. For example, guanabana is a fruit that kind of tastes like strawberries, oranges, and bananas combines. It’s a common fruit in the Caribbean but probably hard to find if you don’t live in a city or town with a large Caribbean population. An easy swap for this fruit is passion fruit, mangoes, or even oranges. Chop up all of your fruit and set them aside. Note: Make sure you drizzle some lemon juice on your apples so that they don’t brown. No one likes browning apples. No sir. Chill for at least an hour. The longer it sits in the fridge the better it tastes! 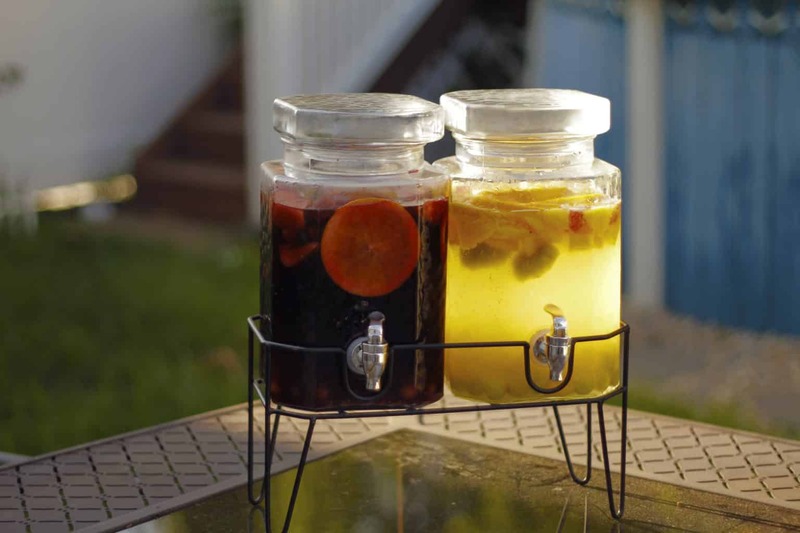 You want the juices from the fruit to really infuse that sangria. That’s a game changer! When the sangria is ready, serve over ice and enjoy! Once you’re ready to serve, pour in the champagne. You want to pour the champagne last so that it doesn’t lose its fizziness. Be sure to check out my YouTube video where I show you how to make these delicious Sangrias! Until next time, buen provecho.